If someone points a bow and arrow at you, do you know what to do? An unnamed man in Melbourne, Australia provides us with a tactic: Hold up your smartphone. In doing that, the arrow pierced through this man’s phone and saved his life. (The phone, however, died in the heroic effort.) This true story took place just a few days ago. The story reminded me of a New Testament I found in the attic of our family home many years ago. My father served in Germany in World War 2, and one of the mementos found in a trunk was a New Testament he carried with him while on duty. What made this pocket-sized copy unique was its metal cover. I’ve found that these Bibles were called “Heart Shield Bibles”. Made by the Whitman Publishing Company in Racine, Wisconsin, there are numerous accounts of soldiers whose lives were saved when the metal covers of these New Testaments stopped a bullet from striking their heart. There are no metal-clad Bibles in my library, but I can affirm that Scripture has saved my heart from destruction on numerous occasions. 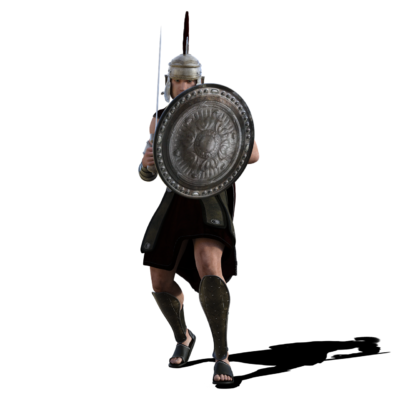 In Ephesians 6 Paul encourages Christians to equip themselves for spiritual warfare. One of those pieces of armor is “the breastplate of righteousness” (Ephesians 6:14). Another is “the shield of faith with which you will be able to quench all the fiery darts of the wicked one” (Ephesians 6:16). In another letter the apostle warned against making riches our ultimate goal: “But those who desire to be rich fall into temptations and a snare, and into many foolish and harmful lusts which drown men in destruction and perdition. For the love of money is a root of all kinds of evil, for which some have strayed from the faith in their greediness, and pierced themselves through with many sorrows” (1 Timothy 6:9,10). Sin can penetrate our most vital spots, and leave us spiritually dead. When Satan attempted to overpower Jesus’ heart in the wilderness, how did Jesus respond? Three times Jesus said, “It is written …” (Matthew 4:4,7,10). Knowing the truth of God’s word deflected the flaming arrows of the wicked one. Your smartphone can protect your spiritual heart if you install and use a Bible app. But the main idea is simple: God’s word is a heart shield. Satan may be taking aim at your heart even as you read these words. Do you have God’s shield raised and ready?